It's that time of the year again. For most Zimbabweans, Christian and non-Christian alike, it's Christmas. But not as we know it, or as we knew it. How many remember going kumusha/ekhaya? I never understood why harvest time was around the time of the end of the first term because even at Christmas, there was plenty of grain, pulse etc in the countryside. And the forests were teeming with hute, matunduru (Oh yes, I still remember the names)- fruits which those of us from the city attacked ravenously, even though our stomachs would give us grief later. That was Christmas then. And everywhere you went, you were stuffed with food. For those that liked ( or were allowed) their drink, there was plenty of the traditional brew. Those from the city would also bring the White man's firewater as well. Christmas in the city was not so bad either. People liked to complain, but ZBC did try to deliver good shows. I should know, having lived in England and suffered from BBC's total lack of taste. To folks at Pockets Hill, I am sorry for being so harsh on you then, I should have saved it for now when you've degraded yourself to the status of a shameless mind-control tool- and a not very good one at that. But then, in those days I did not know what a telescreen was.....I do remember the Christmas after my Grade 5. One of my aunts came to the country later, and she was telling my mother that Prime Minister Mugabe was going to be an Executive President. No one seemed to know exactly what that meant. Oh, we all do now. The Rastafarian community is hit worst by what is going on. This is what concerns me the most, that we are at our lowest possible (it cannot get lower than when a larger proportion of Rastafarian females has no other means of earning a crust than her own body and the average male makes Worzel Gummidge look like a fop in comparison) and we cannot lift a finger to help ourselves. We never seem to have problems organising for useless, meaningless things like turning out en masse to cheer Luciano. But organising for our collective progress, well, I am fast reaching a point where I too will abandon the dream of a vigorous Rastafarian community in a free Zimbabwe. I was trying to talk to some brethren about economic activities that they can engage in when they brought up the subject of something called Kwanzaa. Most Rastafarians in the urban areas have heard of it now. It is supposed to be this great African festival that is celebrated instead of Christmas. Talking to several Rastafarians, I have come to the conclusion that very little is known of it. So, here goes. What his admirers won't tell you is that he has been linked to a C.I.A. plot to counter the emergence of groups like the Black Panthers. In fact, two of his cohorts shot Black Panther leaders as a debate over who should lead the Black Studies faculty at an American University descended in to violence. They were upset over some home-truths- a bit like Zimbabwean politics. When they were arrested, it turned out the two assassins were escaped felons. Karenga then went on to imprison and torture two women members of his group because he did not trust them any more. Not bad for a "great teacher". 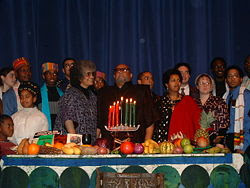 OK, what of the Kwanzaa festival itself? It has been brought to Zimbabwe by.....Rastafarians from the West and eagerly embraced by locals who always seem to think that it is the brethren from the West who have the knowledge and the "more teachings". We already have first fruit festivals in Zimbabwe, with names like inxwala (let's see you get your tongue around that, if you really are fit to teach people about Africa!!!) Now why a Zimbabwean can abandon that, replace it with what appears to be no more two-dimensional than the paper it has been written on, is a mystery to me. But then, when I see the "Rastafarians" sitting at the street corners "reasoning" in affected Jamaican accents, I can understand why one more piece of mumbo-jumbo from the USA would be taken up with such enthusiasm under the much trumpeted banner of "recovering our lost heritage". To all the Rastafarians in Zimbabwe and other places who think that by doing Kwanzaa they are making a bold statement to Babylon, I say; Grow up. A bold statement to Babylon is when you've organised for your bread, places where you can worship and you look after your children etc. Oh, Judah, keep your feasts.